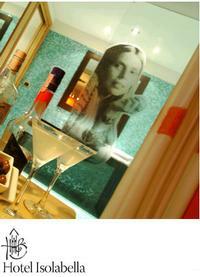 Our JMDL sleuth, Monica, emailed a link to the Isolabella Hotel that includes a room dedicated to Joni!. "The OUR HOUSE room is dedicated to the west-coast rock of the early 70's (Joni Mitchell). The room has been furnished with the help of local artists, for example with larch wood and hand-weaved drapes." The music room, named because of the attention to the quality of sound and background music, was rated by one guest as "very special with attention to detail, and includes a beautiful balcony overlooking the mountains. This room has a Jacuzzi and separate bathroom and an LCD TV & CD player with a large collection of CDs of that genre." This Art & Music Hotel is located in the center of Fair Primiero, in the heart of the Dolomites, in Trentino, Italy.